Cleveland Area History: Repair the Stairs on the Wade Park Bridge! Charles Schweinfurth's four bridges over Martin Luther King, Jr. Boulevard in Rockefeller Park help to define the landscape. These stone structures, built from 1896-1899, help form the space into more of a park. While a cohesive group, each has its own style. The most northern, built for the tracks of the Lake Shore & Michigan Railroad, provides a grand entrance to the park. The St. Clair Avenue bridge, seen here from the south looking north, is monumental without being imposing. 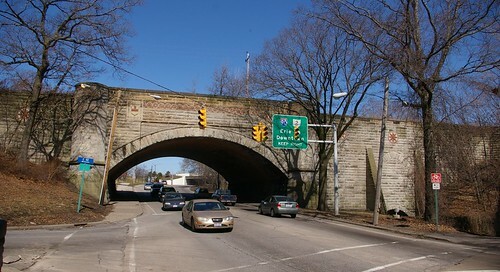 Continuing south, the Superior Avenue bridge, completed in 1897, crosses at a bit of a diagonal relative to the road. 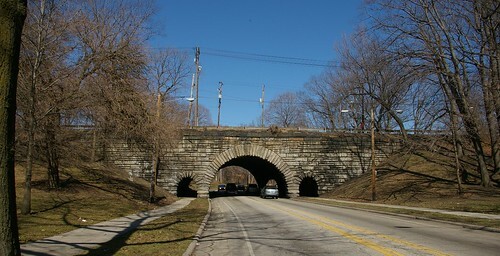 The most southern the bridge for Wade Park Avenue, was completed in 1899. The area at the top appears unfinished, allowing vegetation to spill over, providing the appearance of a grand ruin. Many consider it to be the best of the lot. The significance was further illustrated by the decision of the Historic American Buildings Survey to document the bridge, in 1965. It's worth noting that they too chose to photograph the side of the bridge with the staircase, and that two of the four photographs focused on it. 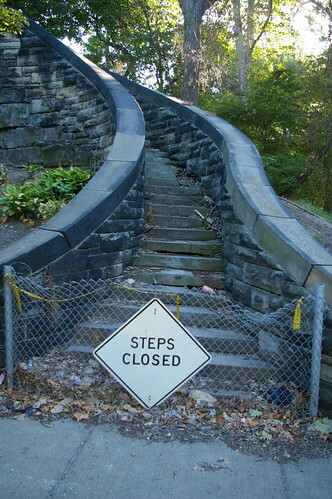 Now, however, the stairs sit in a state of disrepair, closed to pedestrians, as they have been for several years. 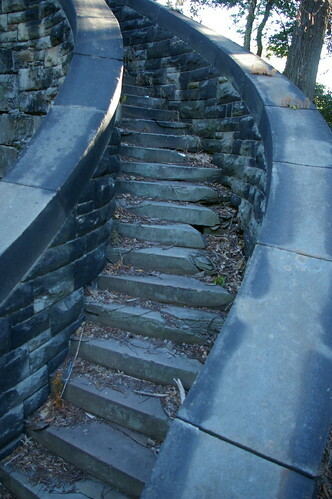 When the stairs were built, they connected the surrounding neighborhoods with this beautiful piece of parkland. At the turn of the century, walking in the parks was a popular leisure activity - unlike many other forms of entertainment, it didn't cost anything more than the streetcar fare to get there. It appears that the problem is the deterioration of the sandstone that makes up the stairs themselves - the walls and rails on either side appear to be in decent condition. I would hope that this could be repaired without becoming a major construction project. The bridge falls into Ward 8, which is represented by Jeffrey Johnson. His office seems an appropriate starting point for this request. 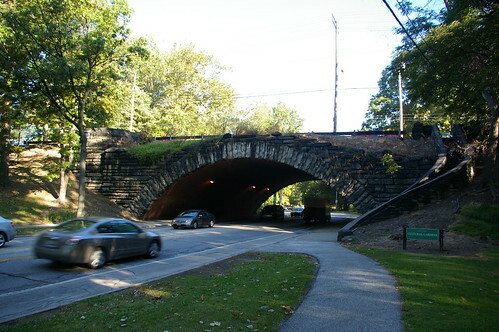 The parkway is used by many as a commuter artery. We should do what it takes to open it back up to the people who live closest to it.